I will not bother with Semi-formal style, as noted here in the post about writing an informal letter in IELTS. In this lesson, we will look at a Formal style of writing here. What is the structure ? Remember that right at the end your name should be written as either first name and surname or Mr /Ms plus your surname, do not just sign off with your first name. When we open the letter it is important to give a brief reason for why we are writing. below are some useful phrases. I am writing this letter regarding…. I would like to bring to your attention the matter of.. I am writing to make a complaint with regards to…. I was wondering if I could ask for …. If possible could you send me the….. I am having a party on Friday and was wondering if you would like to come..
Could you possibly let me know if …. I would like to invite you to …. Unfortunately, this matter is unresolved so therefore…. I wish to express my concern about….. I wish to complain about…. 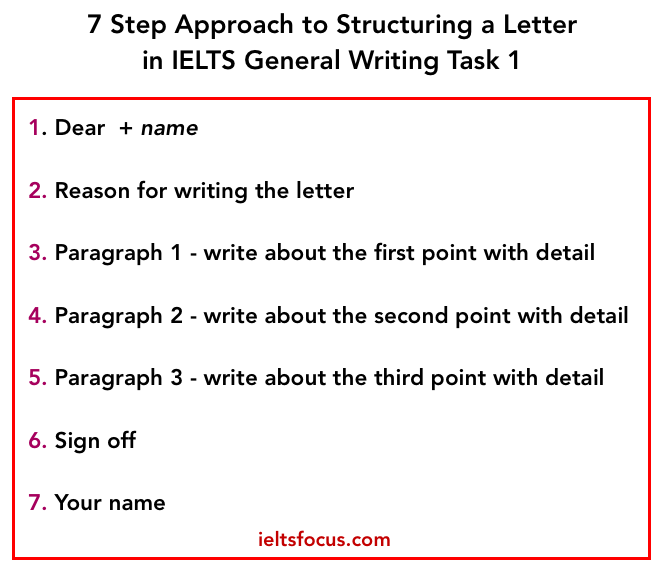 Now let’s take a look at a task from IELTS general task 1. You have made a decision to leave your current job to work in a new company. I am writing this letter regarding my decision to leave the company at the end of March. I would like to take this opportunity to give 30 days notice to resign from my post at the end of March this year. I have enjoyed my time at the company and I am grateful for the assistance you have given me over these 3 years. I have decided because I have been given an opportunity to start work at Google Inc as a robotics technician. As you know, it has been a dream of mine to work in the robotics department of a leading company, so this is a chance I cannot turn down. I have found it hard to come to this decision because I have been very happy working with the technical team here and have learnt a lot about artificial intelligence. Everyone has been very supportive. I feel sad at the prospect of leaving the team here. I was wondering if it could get a reference for my time here at the company, it would be greatly appreciated. (193 words) My advice is to aim for 160 to 190 words in this kind of letter. Did you find this helpful? please share and like on the Facebook page here, or leave a review.